I'm so delighted that summer has arrived. It is the season of my birth and it is the season that I gear my perennial flower gardens towards an explosive bloom time. Now the blooms are just emerging and here's a peek of the show that is beginning to blossom. I love Echinacea. In a few short weeks, my garden will be bursting with a riot of color. The first to bloom is the classic, Purple Coneflower (echinacea purpurea). 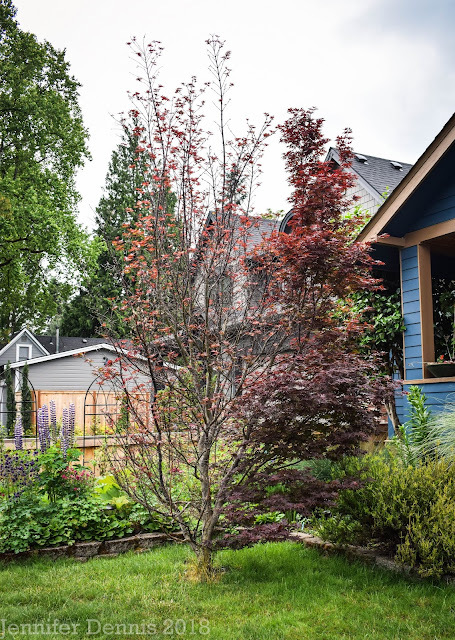 In the above combination, bright chartreuse green leaves from Agastache Golden Jubliee with it's cute fuzzy purple flowering spikes, blend with tall verbena bonariensis. A favorite in my summer gardens is Monarda, or Bee Balm. 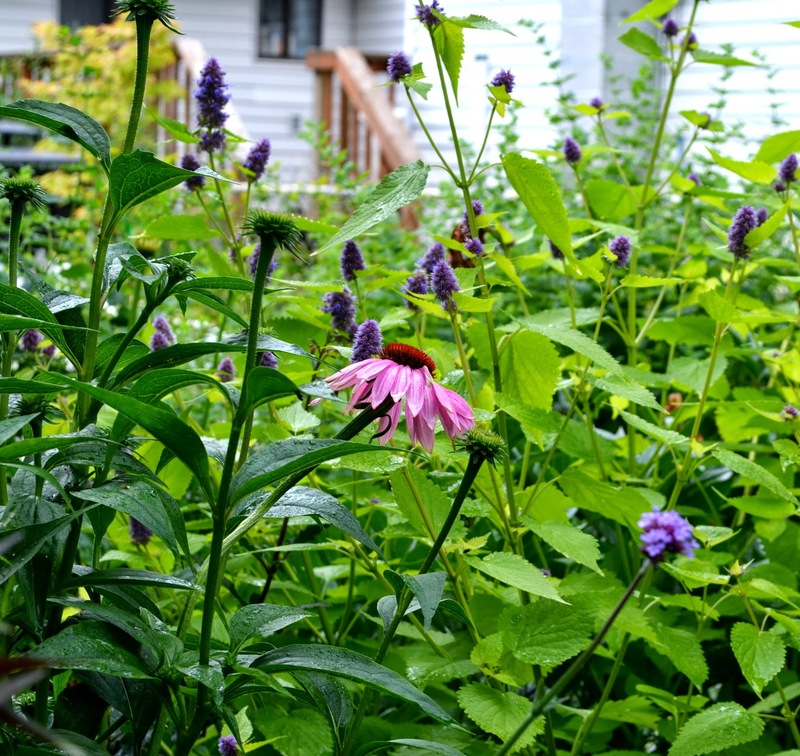 Behind the red bee balm is a new favorite grass, Panicum virgatum 'Rostrahlbusch'. It has gorgeous red tips and it's providing a lovely backdrop. In the distance is Solidago, or Goldenrod. I try to put bee, bird and butterfly attracting plants in my summer ornamental flower gardens. And it's paying off..the butterflies are visiting! 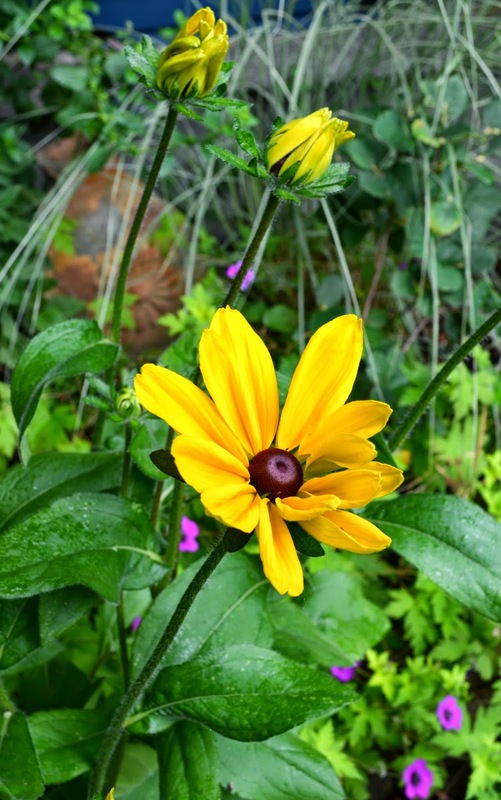 In the front gardens, Asiatic Lilies are blooming as the Rudbeckia's blooms emerge. Usually the lilies are done by the time my rudbeckia's are blooming. 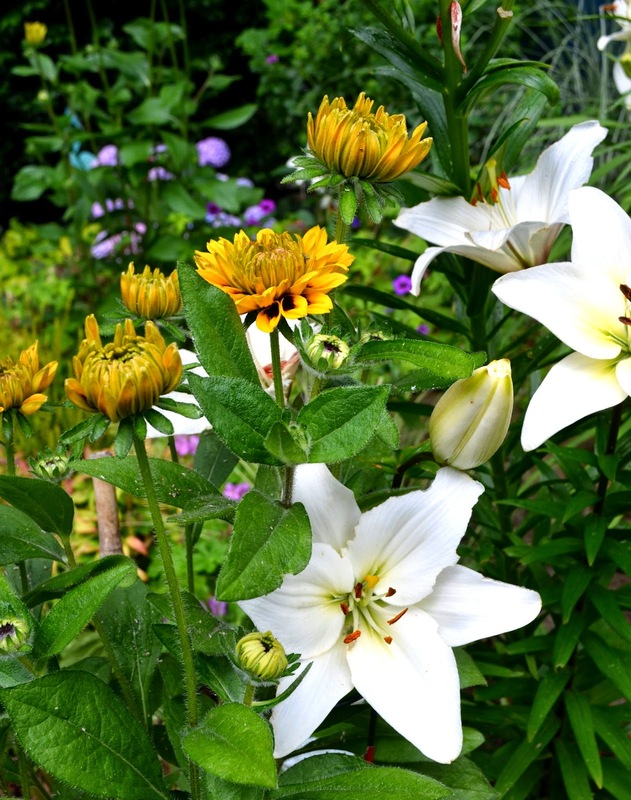 In this pairing, white lily with I think, Cherokee Sunset rudbeckia. Indian Summer Rudbeckia is my all time favorite Rudbeckia. Now, mind you, keeping my rudbeckia's alive through the spring takes quite a bit of work. These guys are a favorite food of slug and can quickly be demolished. Here in the Pacific Northwest, we have ALOT of slugs..thus.. I celebrate these blooms. And finally, I am so excited to see blooms from my Cityline Paris hydrangea. I've had this poor plant for two years. It failed to thrive where it was originally place (my fault..it was too much sun) and nearly burnt to a crisp..now, after being moved to a shady corner in my front gardens it is burst with color. I had purchased the plant post blooms so this is the first time I've seen it's true color. Gorgeous. 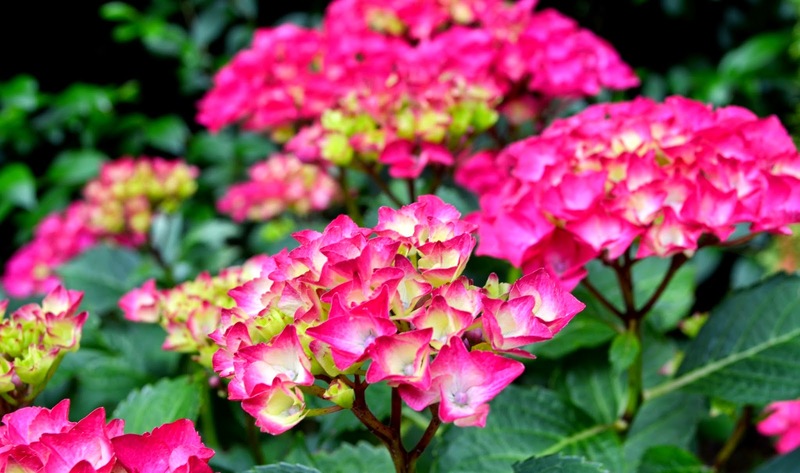 What are your favorite early summer blooms? Your early summer is looking good. Nothing much new coming on here just yet, but plenty of continuation of earlier bloomers that will see me through until the late bloomers begin. Hi Ricki, depending on how long this next heat wave is...some of those late bloomers could get pushed up a bit on the bloom calendar. Beautiful blooms ! I planted 'Golden Jublee this year too, all my other Agastaches died this winter. 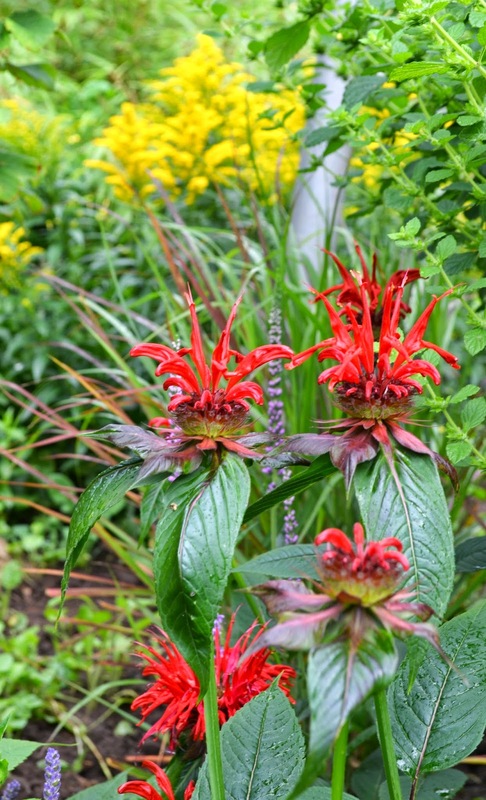 I love Monarda ,it just does not like my sandy soil. You have an Echinacea blooming already! That's great, mine aren't even close. Such a simple flower, but one of my favorites. Kudos on the Hydrangea! Hi Alison, I've only got a few Echinacea blooms...but it's enough to get me excited! I can't wait for the heat this next week. It should really get things blooming. Your early summer blooms are looking terrific. I particularly love that gorgeous Hydrangea. It is obviously loving its new home! I can never pick out a favourite flower - as soon as I think of a possibility another springs to mind. You've got some gorgeous blooms! Like Sue, I love them all! Nice! I noticed a lot of insect damage to my rudbeckias also (but didn't see the bugs). I never thought to look under them for slugs....probably what it was though. They are going to bloom anyway. Love that hydrgangea! Your garden is looking lovely. Lots of nice colour.